When x >= 125, f(x) = e^(-0.5 * ((x - 150) / 25)^2) / (sqrt(2 * pi) * 25) . exp(x), you can also use e^x. pow(x,5) where x is the base and 5 is just a number for example, that raises on x as an exponent. 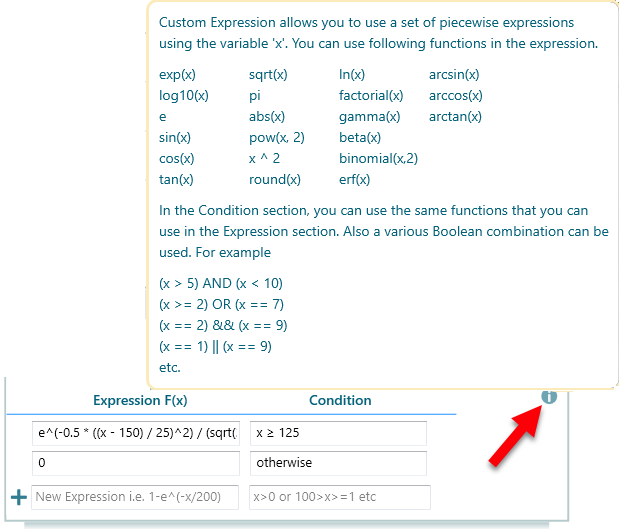 You can also use an expression like x^5 which is also recognized. (x > 5) AND (x < 10) which is equivalent to (x > 5) && (x < 10). You can use either of these styles, your choice. (x >= 2) OR (x ==7), which is equivalent to (x >= 2) || (x == 7). You can use either of these styles.